Karen Kelly has the story. dollars in lost growth and 200,000 jobs. The business leaders say it’ll be even worse. cattle. But a recent report points to another concern: the rising use of such drugs in children. it was the first time usage increased faster for kids than all other age groups. could lead to drug-resistant bacteria. many children today have allergies than 25 years ago. For the Great Lakes Radio Consortium, I’m Mark Urycki. for human consumption. But U.S. farmers refute the report. crops is nothing more than propaganda. U.S. grain, other countries are increasing their import levels. Drug Administration is deciding if it will approve the fish for human consumption. effect on humans and wild salmon. also want the FDA to insure that wild fish stocks won’t be harmed. Water quality experts have a lot of anecdotal evidence that lakes, streams, and rivers in the U.S.
Savage is President of America’s Clean Water Foundation. results to a national database. For the Great Lakes Radio Consortium, I’m Matt Shafer Powell. Grass-Fed Beef Good for Business? six months to a year longer to reach the same size. chemicals often found in commercial beef. is shipped to restaurants and stores, where people are willing to pay premium prices. “In a grocery store, you may pay anywhere from a $1.75/pound to $2.00 for a pound of beef. who raise grass-fed beef don’t have to pay as much to the veterinarian. ‘eatwild.com,’ which compiles research on grass-fed cattle. way for people to fight off cancer. only represents a small portion of the American Beef Industry. comes from grass farms. But he says those farms do fill an important role. Slayton says anything that convinces people meat is safe is fine by him. more familiar than many people think. Shelley says the meat is leaner and can be tougher if cows aren’t fed a little grain before slaughter. consumer-friendly texture to the beef. who’s wife had banned meat from their house for five years. farmers are getting better prices for their meat than even in the best of days past. For the Great Lakes Radio Consortium, I’m Brad Linder. They're not your typical protestors. Photo courtesy of Raging Grannies of British Columbia. The Grannies deliver their message with a satirical song. Photo courtesy of Raging Grannies of British Columbia. 63-year-old Margaret Slavin-Diamond says the grannies are true subversives. 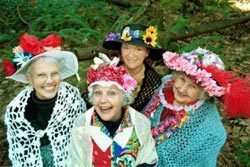 The first group of Raging Grannies was founded in British Columbia in the mid-80s. There are now about 60 groups, including chapters in Minnesota, New York and California. must be a woman and over 55.
outfits, Rose stands out. She wears a neon striped dress and bright yellow feathers in her hair. the group with help of a rubber chicken. Sierra Club says the grannies’ style is effective. shielded a protestor, preventing his arrest. Others were tear-gassed. Margaret Slavin-Diamond says she’s seen grannies challenge an officer in riot gear. able to do from our hearts. As charming as these women seem to be, law enforcement officials do take them seriously. listed them as a subversive group. It’s a label they wear proudly. in protecting the U.S. from importing harmful species. organizations, must work together to be successful. also calls for current funding levels to be quadrupled. more people thinking about the benefits of life without cars. mass ride…held in San Francisco in 1992. For the Great Lakes Radio Consortium, I’m Jerome Vaughn. State to Ban Mercury Thermometers? but say more needs to be done to curb the threat of mercury pollution.